There was the short rain delay which perhaps was the only threat !! 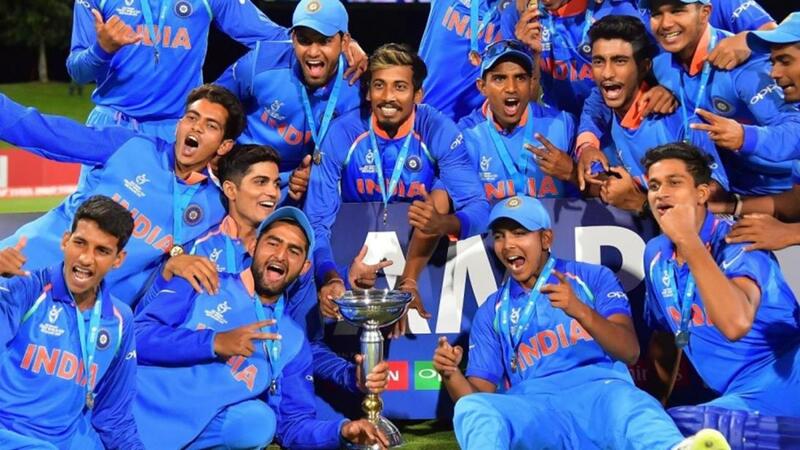 ~ Most of the Indian fans were hooked to the TV screens since morning and it was happier moment in the Afternoon ~ India winning the U19 Cricket World Cup 2018 in Newzeland for a record 4th time. Opener Manjot Kalra produced a sparkling 101* as India scored a handsome eight-wicket victory over Australia at the Bay Oval in Tauranga today to become the first side to win four titles at the ICC U19 Cricket World Cup. The elegant left-hander struck eight fours and three sixes during his 102-ball knock as favourites India coasted to 220 for two in 38.5 overs, much to the delight of Indian supporters. For those of us watching, there was mild drama on whether Kalra would reach the ton given the lesser no. of runs in the hunt. A combined bowling effort had earlier helped dismiss Australia for 217 in 47.2 overs. To the uninformed, it was a 16 Country tournament – starring : 1. India; 2 Australia; 3. Pakistan; 4. Afghanistan; 5. South Africa; 6. Bangladesh; 7. England; 8. Hosts - New Zealand who were thrashed by Afghans; 9. Sri Lanka; 10. West Indies; 11. Zimbabwe; 12. Canada; 13. Ireland; 14. Namibia; 15 Kenya & 16. Papua new Guinea. To those interested the Indian team of the day that beat Aussies in the finals was captained by Prithivi Shaw; Manjot Kalra – man of the finals; powerfull puller Shubman gill named man of the tournament; wicket keeper HM Desai; Rian Parag; Abhishek Sharma, Anukul Roy, KL Nagarkoti, Shivam Mavi, Shiva Singh, Ishant C Porel. In the 1st match – one would have expected to be a trial by spin for Australia. Instead, Kamlesh Nagarkoti and Shivam Mavi, the Indian quicks, were zipping and hooping the ball under Tauranga's night sky at over 140kph. The speed gun, the calibration of which varies from broadcaster to broadcaster, pegged Nagarkoti's fastest ball at 149kph. Mavi's fastest ball was just a shade slower at 146kph. Irrespective of whether this was accurate or not, watching them run in with intensity and flatten the stumps repeatedly was quite a sight. • 7th match, Group B: at Mount Maunganui - Jan 14, 2018 - India 328/7 beat Aussie 228. · 11th match, Group B: India at Mount Maunganui - Jan 16, 2018 ; Papua New Guinea 64 (21.5 overs) lost to India 67 without loss in 8 overs. · Quarter-Final: at Queenstown - Jan 26, 2018 : India 265 beat Bangladesh 134 all out. Today in the finals, Australia batting first made 216 (Merlo 76, Uppal 34, Anukul 2-32, Shiva Singh 2-36) ~ India successfully chased the score - 217 for 2 (Kalra 101*, Desai 47*, Gill 31) India sauntered to a record fourth Under-19 World Cup title in front of a partisan crowd of 4000 odd at Bay Oval, to finish an unbeaten campaign that had begun against Australia at the same venue three weeks ago. The margin of victory then was 100 runs, and it was comprehensive in the grand final as well - eight wickets. This win incidentally was its second highest successful chase in U-19 World Cups, after the 226 to beat Australia in Townsville in 2012. Unmukt Chand had led that chase with a sublime century. The inaugural competition in 1988 boasts perhaps the largest pantheon of skippers, starting with Brian Lara. Michael Atherton also skippered in 1988 and is England’s second longest-serving skipper after Alastair Cook, who featured in the 2004 competition but not as captain. Pakistan’s skipper Inzamam-ul-Haq was another captain to feature in 1988 and held the same role in the senior side for seven years, Additionally, that year unearthed Sri Lanka’s Sanath Jayasuriya, who skippered his country from 1999-2003, recording an impressive 47 per cent win rate. ICC U19 official website states that prior to Manjot Kalra’s ton – there have only been four centuries in U19 CWC finals, all by openers and all by the team batting second and incidentally none of them went on to represent their countries – Kalra should break that jinx. In 1988, Brett Williams hit 108 as Australia replied to Pakistan’s 201 with a controlled 202/5. In the next tournament, 10 years later, Stephen Peters cracked 107 as England chased down New Zealand’s 214/6 for the loss of three wickets with four overs to spare. In 2002, Jarrad Burke led Australia’s response to South Africa’s 206/9, hitting an unbeaten 100. In 2012 finals, India Unmukt Chand hit the highest score in a final, an unbeaten 111 from 130 balls. Chand has now played 60 first-class games and appeared for three IPL franchises – the Delhi Daredevils, Mumbai Indians and Rajasthan Royals – and even hit three domestic T20 centuries, perhaps may one day play for India as he is still young ! India is celebrating ~ what a match it was today..